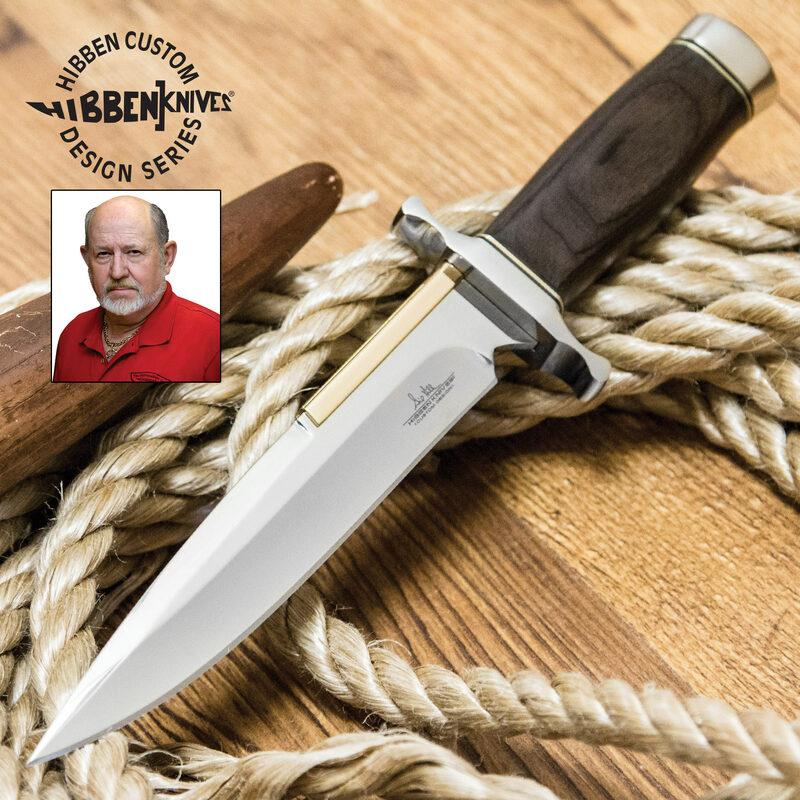 Gil Hibben Old West Fixed Blade Boot Knife With Sheath | BUDK.com - Knives & Swords At The Lowest Prices! KNIFE WAS EXACTLY AS PRESENTED. NO FLAWS AT ALL. DELIVERY WAS UNEXPECTEDLY PROMPT. I WOULD SAY IF YOU LIKE IT. GO FOR IT. A SOLID WIN. Knife is excellent. But the sheath doesn't appear to be made for this knife. The handle is so much wider than the blade, there is not enough offset to where the blade sits in the sheath that the sheath has to bend around the handle, making it very bulky when clipped into the boot. Plus having to force the knife into the sheath in order to get it low enough for the strap to snap is not ideal either. I liked this one due to the location of the clip, my other boot knife has the clip much lower on the sheath and it ends up working its way loose as I walk. Having one that completely hides inside the boot was what I wanted, and this sheath should provide. This is my second Gil Hibben knife. I was so impressed with my GH Bowie, that I wanted a boot knife for work. It arrived sharp and beautiful. But......the clip is set too high for mid-high boots. Very disappointing. I ended up getting a lesser knife for daily carry that was not sharp at all. I cannot carry exposed knives at work, so my GH "Old West" boot knife stays at home on my nightstand. Shame. This could have been one of the nicest knives I have seen yet this afternoon.. The only thing needed would have been a little better judgement when adding the guard, they should have bull nosed the edges giving it that little extra TLC to a great design, and quality look to complete it's finish...! As usual, The knife did arrive early, about 4-5 days after ordering it. 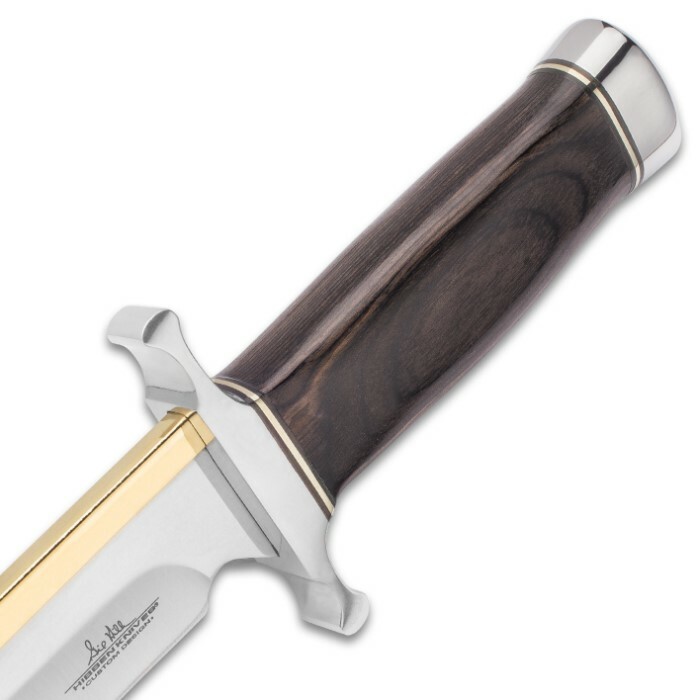 Was looking for an every day carry that has dagger dimensions but is legal in California. This knife is perfect, Shaped and built like a dagger, but only single edged. The knife does have a boot clip, instead of a belt loop, for clipping on the tops of boots, but this clip also very useful if you prefer to carry a fixed blade, but don't like going into public areas with it. Sheath can be unclipped quickly, and stored. Handle is great, Very dark wood reminiscent of ebony or teak, almost black with grey grain. I used a 50-50 mixture of beeswax and pine sap to seal the handle wood. heated up very hot and then brushed on the handle, allowing as much to soak into wood as possible. Then cooling in freezer makes the handle supper hard, And neither beeswax or pine sap deteriorates, ever. then polished to a mirror finish, A really beautiful knife for the price. Above and beyond the quality expected. 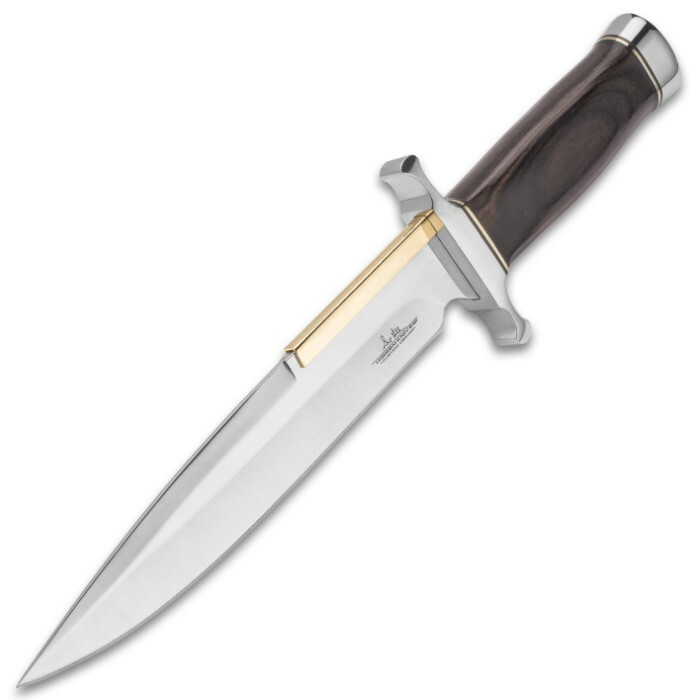 I recommend this knife to anyone who likes daggers, but wants a legal version. Very Sharp right out of the box. Well polished, right from the box to the wall display. 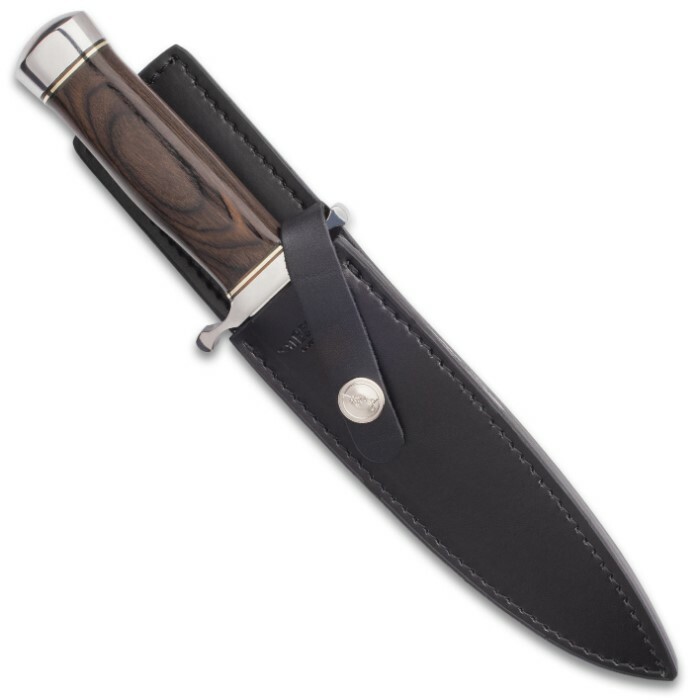 Sheath is heavy leather and well made, not extreme but will protect the blade when needed. Solid, would do exactly what a knife needs to do when you need it to do it. 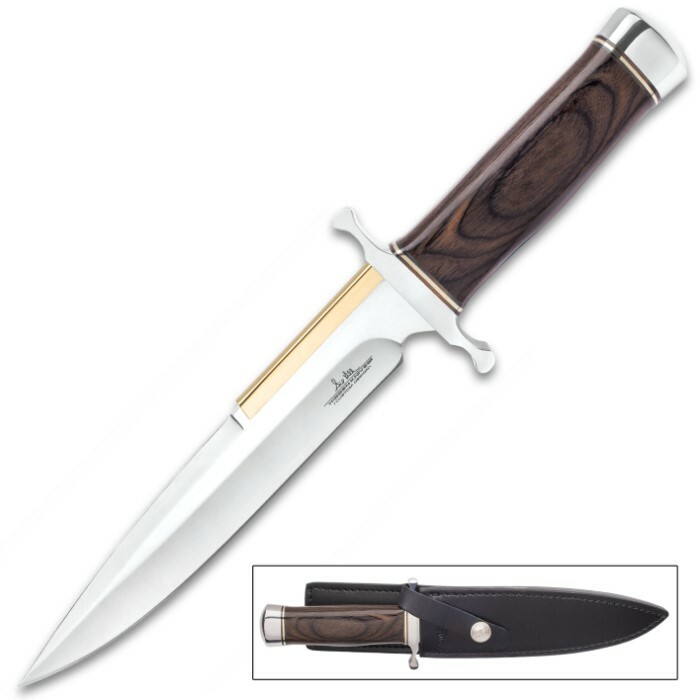 I bought this to match up with my Gil Hibben Arkansas toothpick, they look great together. I love this knife. Mine came sharp out of the box. It is just a smaller version of the Old West toothpick, same fit and finish. I own them both and this smaller version is a great addition to my collection.